If you are selected for verification, and requirements were not completed by using the IRS Data Retrieval Tool, an email will be sent to your UNA portal, and you will be required to provide documentation to verify the information you reported on the FAFSA. You will be notified by your UNA portal and email, if you have any outstanding requirements that must be met before a federal financial aid award will be made. 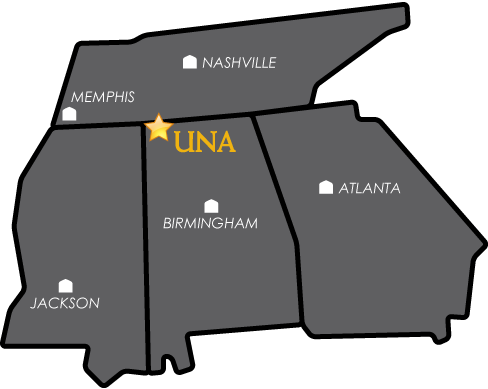 You can review outstanding requirements on your UNA Portal in the Financial Aid Requirements section. If you were selected for verification, the documentation you submit will be compared to the original FAFSA and corrections may be made. These corrections could change the student’s EFC (Expected Family Contribution) which could affect the award amount. If corrections were made you will receive a new SAR (Student Aid Report) from the Department of Education. After verification is completed you will be notified through your UNA portal and email when a federal financial aid award has been made. The award may be viewed on your UNA account under the Financial Aid Awards link. Submitting unrequired documents could slow down the award process. You will be notified by your UNA portal if you have any outstanding requirements that must be met before a federal financial aid award will be made. This tool allows IRS tax return information to be transferred directly into the FAFSA and populates answers to the required financial questions. If you did not use the IRS Data Retrieval Tool and it has been three weeks since you filed your federal income tax, we strongly encourage you to update your FAFSA under the Tax Information section. If you are selected for verification, using the IRS Data Retrieval Tool will complete some or all of the verification requirements. In the Tools section of the homepage, click “Get a Tax Transcript”. Click “Get Started” if you do not already have an account or returning users can enter their username. Upon successful registration, you will be given the option to “continue” and use Get Transcript Online. It will ask you the reason you need a transcript to help you determine which type may be best for you. Make sure that you select the 2015 Tax RETURN Transcript. Your IRS Tax Return Transcript will come up for you to view. You can then either print the transcript and send it to us or save it and e-mail it to our office. Find out if you have a local IRS office near you by going to https://apps.irs.gov/app/officeLocator/. If there is an IRS office near you, you may go and request them to print it off for you. You must have a photo ID with you and cannot request tax documents for anyone other than yourself. Acknowledge the disclosure pop up box that appears by clicking "OK"
Complete the required fields (SSN, Date of Birth, etc.) and click "Continue"
If successfully validated, tax filers can expect to receive a paper IRS Tax Return Transcript at the address included in their online request, within 5 to 10 business days from the time the on‐line request was successfully transmitted to the IRS. IRS Tax Return Transcripts requested online cannot be mailed to an address other than the address on file with the IRS.